When was the last time Atok hugged me? I think I was 12 years old then. But, i can't recall what was the occassion about. Atok is a conservative type of father. He doesnt really show his love for his children in front of them, you know ... the old-grumpy-nagging kind of style. To be true, he is not a huggable person, and he never 'encouraged' that among his children. Even though Atok is a strict person, he is undeniably a loving father and a loving husband. He never laid his hands on me or my sister without reasonable ... or even my mother. One time, I remembered when he scolded and had a little 'wrestling' with my brother for his misbehaviour while he was in his 20's. He wouldn't do that if my brother would have listened to him. Boy ... he was 'naughty' that time. Big time illegal street racer! lol. There are many good values that we as his children really respect him for and love him as much as he loves us. He would do his best to fullfill his child's needs at any cost. He may not be the right person you can ask questions on mathematics, but he wouldn't say no when it comes to buy a book. Looking at this picture, I began to realize now how I really missed those moments with Atok. 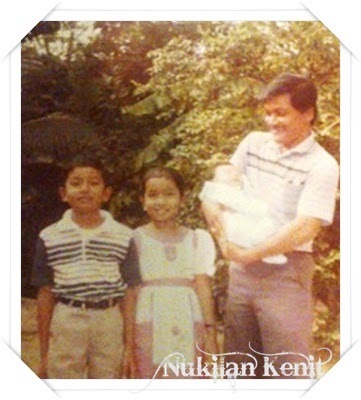 Though I was still a baby and couldn't really 'feel' Atok's hand uphold me in his arms, I could tell from his bright smiley face that he was happy and blessed to be given such adorable kids (especially for that little cute baby ... me hehe). Wan said, life was tough for both of them with Atok worked as a driver and Wan had to sell nasi lemak just to raise us 3 siblings and put us in school. For a start, Atok & Wan lived in a squatters area in the middle of the Kuala Lumpur city before we got to move to a flat in Bandar Tun Razak. But Atok never gave up and never complained over what Allah had got for him. Despite all the difficulties he and Wan had to go through, eventually Allah had granted his wish to perform Haj in the year 2007. Atok said, that (performing Haj) was the best gift he could ever get and it was worth it with all his hard work all these years. One day, Atok called and said he couldn't breathe and had to go to the hospital. For a moment, i couldn't think straight worrying how is he going to handle his sickness when not one of his children is there to drive him to the hospital and assist him. Nothing worked well for me that day, as I rushed back to him immediately leaving behind all my works at the office. I cried all the way to the hospital praying to Allah please don't take Atok today ... not today ... not this way. Oh Allah! please grant my father and mother a good health and preserve them from all the wrongdoings. "My Lord! Bestow on them Your mercy as they did bring me up when I was young"
Kedua-dua belah atok xde sejak kita kecil lagi... Sekrg ni tmpg kasih atok blh suami aje la..